Can you see the basic human predicament? 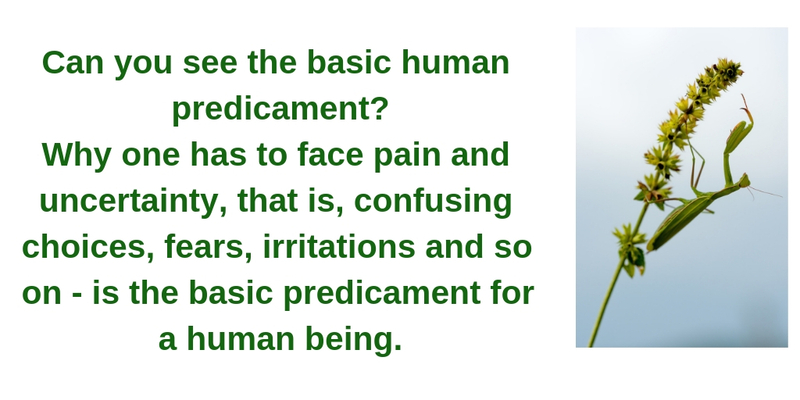 The basic human predicament can not be solved by any positive explanation or statement. It is rested when you notice it. There is only one step; you have to disregard silently, spontaneously the relief offered by books, gurus, techniques, various entertainments and so on against your present state, which you call unsatisfactory. Why one has to face pain and uncertainty, that is, confusing choices, fears, irritations and so on – is the basic predicament for a human being. Any discomforting or irritating situation and uncertainty creates uneasiness in your nervous system. One tries to throw away this uneasiness by solacing explanations or by diversions like entertainments, religious-spiritual ideas. Mind is enamoured as if it will resolve this uneasiness. Unless this uneasiness is experienced ‘as it is’, energy is not concentrated. One becomes addicted to escapes. Loses contact with the Life energy.